Bridges - Willow Grove PA - Kent Lane Mueller D.D.S. Dr. Mueller offers many treatments to those who have missing teeth. 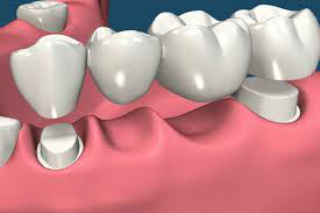 One permanent treatment option is the fixed dental bridge. This non-removable appliance can aesthetically replace one or more missing teeth, effectively restoring the function and beauty of your smile. ​Created using tooth-colored material such as porcelain, fixed bridges can also be anchored on a dental implant for the most permanent, stable, and natural results possible. ​We invite you to call our office in Willow Grove today if you are missing any teeth to discover how Dr. Mueller and our exceptional team can restore your oral health and smile with a fixed dental bridge.